Besides also belonging to the series Australian Lunar Gold Proof Coin Series II which was minted by using as precious metal gold, the Perth Mint also issued the Lunar Dragon silver bullion coins in various denominations and the Lunar Dragon 1/2oz silver coin is one of these denominations, being minted in 2012. The complete series of Lunar Dragon silver coins was issued in 2012 because this is the year of the dragon in the Chinese calendar and the entire series Lunar coins will get to comprise all of the twelve Chinese animals representing the Chinese zodiac. For example, 2011 was the year of the Rabbit and 2013 will be the year of the Snake. This is why the Lunar Dragon 1/2oz silver coin was issued in 2012 and this is the only year when it will be minted. The Lunar Dragon 1/2oz silver coin has 99.90% fineness. So it weighs 15.55 grams of pure silver. The reverse of the Lunar Dragon 1/2oz silver coin strikes the viewer through its mythical force that it emanates thanks to the fierce dragon with four legs engraved on this side of the coin. The Chinese pearl of wisdom is also present here along the inscriptions Year of the Dragon in English and Chinese. The obverse of the Lunar Dragon 1/2oz silver coin is a depiction of the portrait of Queen Elizabeth II, the same distinguished obverse for the Australian coins. Also on the head side of the Lunar Dragon 1/2oz silver coin is inscribed ELIZABETH II, AUSTRALIA, the minting year 2012, 1/2oz 999 SILVER, together with the face value of 50 CENTS. The Chinese zodiac and its signs has become for many producers an occasion to exploit its symbolism through different marketing strategies in order to attract clients. The Australian Perth Mint issued the Lunar Dragon 1/2oz silver coin and other denominations plus in the previous years starting with 2008 it engraved other signs from the Chinese zodiac. So the Perth Mint used this idea with the Chinese calendar in the most possibly beautiful way making numismatists to start new collections and the Lunar Dragon 1/2oz silver coin can be the start of that respective collection since it is the smallest denomination from the series. It is a young series which makes investors desire that a new year has passed in order to acquire the new silver bullion coins. 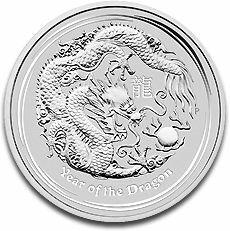 When it comes to the Lunar Dragon 1/2oz silver coin it can suggest the idea of a bulk investment because anyone can afford this modern silver bullion coin that was issued in 2012. And that is the idea behind investing into silver, it is accessible to anyone and there are numerous varieties from which to choose. Besides being regarded only as a bullion coin, the Lunar Dragon 1/2oz silver coin can also be looked at as at a beautiful present, which will be special and different and though it has all these qualities it would not empty your pockets at all.